I was tagged by the lovely Kimberley from Kimberley’s Beauty Blog, the lovely creator of this great tag! You should definitely take the time to take a peep over at her page! – Share 12 random facts about yourself. – Answer the 12 questions. 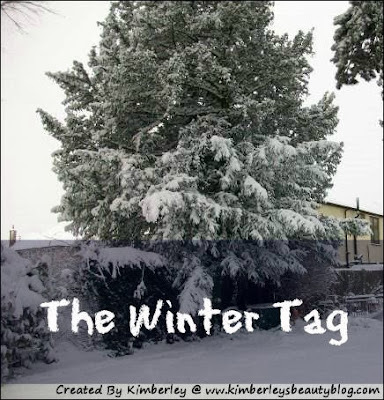 – List 12 bloggers you want to do the tag. They can be anyone you want. – I believe it is not Christmas until Love Actually has been on TV. – I get a bit too excited when I enter a Boots store. – Shopaholic – but aren’t we all?! – I absolutely love snuggling up in bed with a mug of hot chocolate and watching Miracle on 34th Street. – I love just wearing a pair of comfy leggings, some thick socks with my cute Sainsbury’s beige ankle boots and an over-sized jumper. Closer to Christmas, I love to rock this combo with a hideous Christmas Jumper! -This has got to be, without a doubt, Chocolate Gateaux on Christmas Day. Such a family tradition! – Cuddled up in bed or on the sofa with my family around me, the fire on and watching Christmas movies. – I like keeping my make-up fairly neutral in the winter, usually keep it to just a cream base shadow and some liner and mascara with a neutral lip. However, for a night out I like to add a bit of a smokey eye. – My main present that I’m hoping Santa brings me is a car, but I know that this is very unlikely, I’d love the Urban Decay Naked Palette and a massive jar of Christmas Cookie Yankee Candle! – Cold, Fluffy Socks and Christmas. – Any Elvis Presley / Michael Buble Christmas tunes are my must have Crimbo ear candy!. – Leaving Cookies and Carrots out for Santa and Rudolph, can’t get any better than that! – Christmas Cookie Yankee Candle is the BEST winter scent around. No Cinnamon for me – yuk! Finish this sentence… If I could have one wish this Christmas it would be…..
– … for no snow. I know that’s really superficial and grinch-esque, but there is nothing worse than snow and it causes so many accidents! Thanks for doing the tag Hun, I loved reading your answers! I hope you get your car! Great tag! I'll definitely be doing this! I love your blog, thanks for the link I'm now following on GFC and bloglovin!